Mauritius is one of those islands that one does not hear about often, but it is not because it is not a beautiful place. The picturesque island sits off the Africa's east coast and is well-known for tourism and for tea. What the chess world has discovered is since 1986 this small island (population: 1.1 million) has sent teams to the Chess Olympiad tournaments. 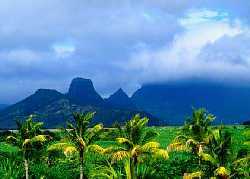 This island has approximately 1000 chess players and while it is, in large part, secluded from the chess world, Mauritians participate in the Southern Africa Zonal tournaments and the African Junior Championships. Mauritius sits in the Indian Ocean, and like many island nations has a diverse population with a combination of Indian, Chinese and Black Africans. Chess Olympian Patrick Li Ying states, "In the Olympiad we used to meet our friends from the Caribbean islands especially Trinidad and Tobago which I hear is a very similar island to Mauritius in climate and mix of population." Li Ying, a Mauritian of Chinese origin, participated in last African Zonal held in Botswana and the African Team Championship in Cairo. He mentions that high school level chess is thriving. On the other hand, there are only a couple of adult chess clubs holding about 4-5 tournaments per year. Women are not particularly active, but there are school girls who have shown interest. There are plans for the Mauritius Open which will serve as a qualifier for the "Masters Tournament" in August. This tournament will feature the island's top 10 players. Li Ying then discussed competitive chess in Mauritius. 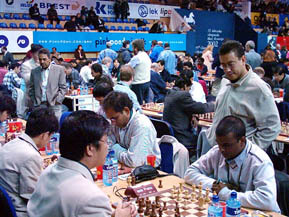 Brunei vs. Mauritius at the 2002 Chess Olympiad in Bled, Slovenia. Board #1 player Roy Phillips is observing the games. There are lots of Afro-Mauritian players who compete in the tournaments but the two best, namely Ronald Raimbert (who is in semi retirement) and Patrick Marie, did not play in the Bled Olympiad. Marie has a FIDE rating of 2200. I think Raimbert played in Moscow and Yerevan Olympiads whereas Marie played in Moscow, Yerevan and Istanbul. I personally have played in four Olympiads Novi Sad, Manila, Istanbul and Bled. Our top player at the moment is Roy Phillips a newly arrived player from Britain who holds Mauritian citizenship he is rated Fide 2219 and has lots of experience in the British circuit. I have been national champion of Mauritius in 1989, 1991 and won three Masters in 1993, 1994 and 1996. Devarajen Chinasamy who played in Bled won two national championships in 1999 and 2001. Thus we had three good players in Bled but unfortunately experienced players like P. Marie, R. Raimbert and P. Seegolam could not make the team. The best showing of the Mauritian Olympiad team has been 84th place in 1992 in Manila where they scored 25 points. In the recent Bled Olympiad the team scored 24 points, but had solid performance by a number of players. Devarajen Chinasamy scored a respectable 8-6 on board #2 while English immigrant Roy Phillips scored 7½-5½ on board #1 including a win over South Africa's IM David Gluckman. Li Ying scored an even 6½-6½ closing out the top three Mauritian players. The Mauritius Chess Federation is planning to attend events in mainland Africa and is currently planning a chess trip to Cape Town this December to play against the local clubs. Li Ying is currently in negotiations with Lyndon Bouah the President of Western Province Chess Federation concerning this event. Stay tuned for upcoming news about Mauritian chess! (L-R) Hurrynarain Bhowany, Lindsay Rohan, Devarajen Chinasamy, Rajah Bhowany, Sabina (Slovenia Guide), Patrick Li Ying, Jugputty Callychurn, Sada Paupoo and Roy Phillips.